Lacerte tax software, developed by Intuit, is by far one of the most productive and useful software for tax-related processes. It is quite popular among tax preparers and CPAs who are working round the clock during the tax season. According to the latest survey from The Tax Adviser and Journal Of Accountancy, Lacerte is one of the popular tax software for both personal and business returns and earned an average rating of 4.4 on the scale of 5. From numerous tax forms to the files or documents which are required to be maintained during an audit, the accessibility of documents anytime and from anywhere is vital for success. This is where hosting Lacerte tax software on cloud increases its potential by a mile. When all your tax data is available in a centralized system in the cloud, your staff will spend less time digging through folders on different devices or sending/receiving emails to get the information required. It helps them prepare more tax returns in less time. Additionally, with automated processes like billing and reporting, man-hours required for such internal tasks in potentially reduced. Lacerte tax software data is crucial and may be needed even after years of filing a return. Thus, it is important to take utmost care of data storage. With desktop storage, some issues may occur, such as damage to the device, data theft, or accidental deletion. With changing technology, moving data to another device may bring the challenge of data transfer. However, when Lacerte software is hosted on the cloud, multiple backups are maintained automatically and in case of data loss, you can quickly restore your data. Lacerte cloud hosting allows multiple users to work simultaneously from the central database and makes it easier to collaborate with outsourced employees like tax preparers or CPAs easier. Employees or tax professionals can easily share files with the client even when they are working remotely on them. Lacerte hosting also eliminates the need to move data to and fro via emails or the need to copy and sync data. Security of your tax data or files is undoubtedly most essential for your business. Any threat to security can occur because of laxity in data transfer or threat to server storage features. When your Lacerte software is hosted on the cloud, you get the best data security possible with third-party cloud providers. Your data is saved in highly protected data centers along with multiple backups. Moreover, data transfer is safe as it is enabled via encrypted data transfer protocol and multi-factor authorization to access it. Only the person with a valid user ID and password can access the files or tax data. 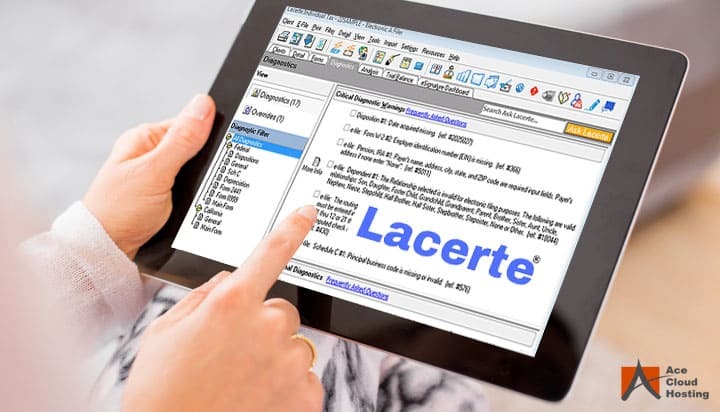 With Lacerte tax software hosting you do not have to install the software on your premises, as it is installed and run on the terminal servers. There is no need for a dedicated system on your premise or the need to invest in continually upgrading the infrastructure. With the cloud features such as remote upgrades and round the cloud support team, businesses would need fewer resources and IT workforce, thus helping them save money. For various business requirements, Lacerte tax software is often needed to be integrated with other accounting software such as QuickBooks. However, installing multiple software on the same system, integrating, and further storing the data can hurt the performance of the system. On the other hand, cloud server resources can easily be scaled according to the requirements, making integration of Lacerte software with any other accounting software easier as compared to the traditional system. The unlimited capacity of cloud technology makes it an ideal solution for tax professionals, CPAs or accountants to keep up with the competitors in filing tax returns efficiently. If you want to get cloud benefits along with updated features of Lacerte tax software, hosting it on the cloud is highly recommended. 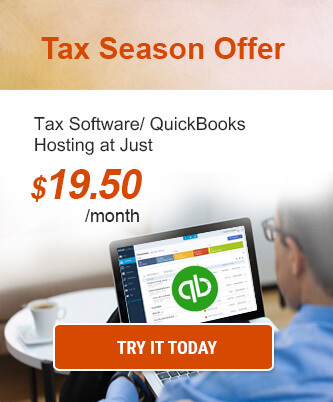 Why Hosting ATX Tax Software On Cloud Is the Right Choice for You? Why Drake Software on Cloud Makes Sense? 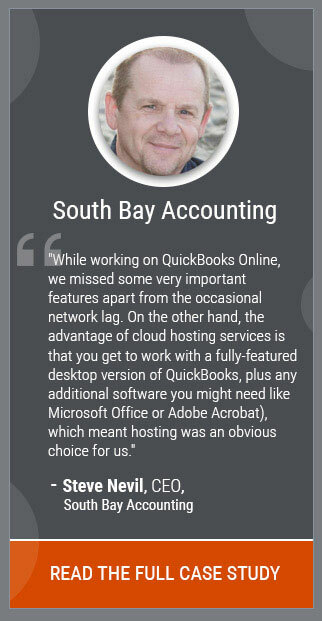 7 Reasons Why Your Business Should Use QuickBooks Enterprise Hosting [Video] How ATX Software Hosting Benefits Tax Preparers? The smooth integration with numerous add-ons and the time that Lacerte software on the cloud saves has made my firm’s tax season a little easier. Everyone in the accounting industry should give it a try once. I agree, Samantha! After my files were stolen from my desktop at the office, I got paranoid about my data files. However, with the hosting of Lacerte on the cloud, my fear of losing my data files has gone down as my data is no longer in my desktop.